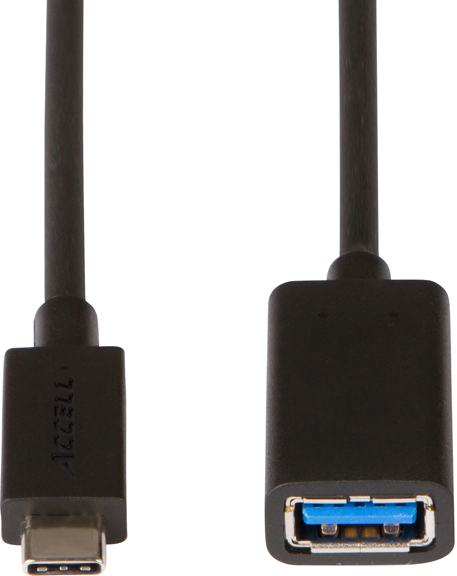 The Accell USB-C to A USB 3.0 Adapter connects a flash drive, charge/sync cable, mouse, or other USB-A accessory to a USB-C device. The adapter features a reversible USB-C connector which always plugs in right side up. This adapter is USB 3.0 compliant, enabling data transfer up to 4.8Gbps. The adapter also supports up to 1.5A of charging output (USB Battery Charging 1.2 standard) to swiftly charge USB-A devices.